Chopper wasn't at all a likely character to spin out of Judge Dredd proper and into his own stories--he'd carried a bunch of solo episodes in "Oz," but those had seemed like a one-time opportunity to throw a spotlight on him. There's no way he could have carried an ongoing series; part of the fun of the stories collected here is that they're occasional check-ins over a period of fifteen years, and a lot of time passes between them. And yet the best of them are absolutely fantastic: powerful, funny, grim, moving. Maybe it was just something John Wagner saw in him. 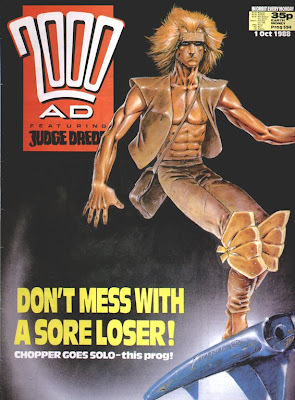 "Soul on Fire" is a different kind of story from 2000 AD's stock in trade; I can't think of another story that long that had run there at that point that involved no violence at all, just an unofficial athletic competition. It recapitulates the final sequences of "Oz," but in a much calmer way. Colin MacNeil's artwork isn't quite what it later became--he's still a little iffy at drawing facial expressions, and breaks the grid he sets up on almost every page (usually a sign of an artist who's trying too hard to make things look exciting)--but he's already really good at keeping the story flowing, and giving some very crowded-with-panels pages a sense of stillness and quietness. 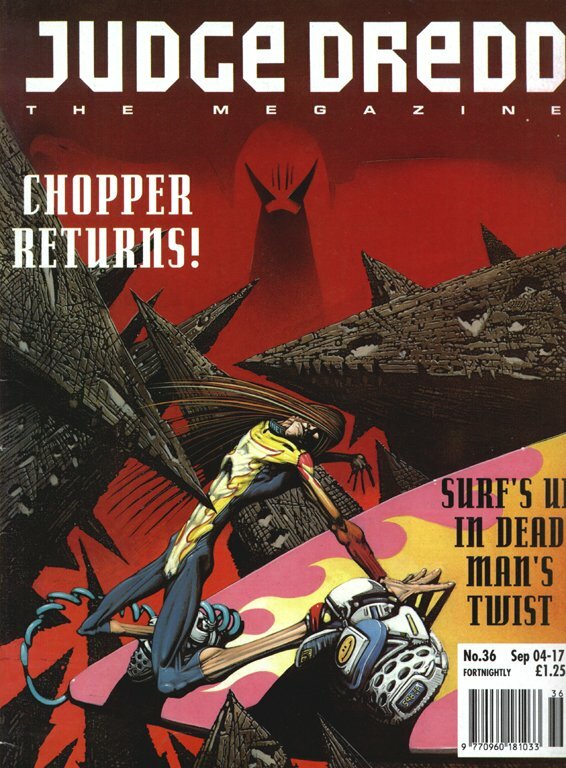 So here's the thing about the end of "Song of the Surfer": Chopper is dead. Nobody comes over to him, looks at his body and says it explicitly, but every single dramatic cue of the story implies as strongly as it possibly can that he dies without quite reaching the finish line, including that final page where it pulls back on the gigantic word "FINISH" - "FINISH" - "FINISH." He's had his last-minute conversion to aggressive action to avenge his friends, but he's failed Charlene and failed himself in every other possible way. That's why the ending is powerful. Even beyond that, Chopper's nearly unalloyed victory in "Earth, Wind and Fire" isn't particularly like him: he's the hero of his own story, and a hero to the people who appreciate his resistance, but he's not a hero. (I also think it's kind of hilarious that a major plot point hinges on the distinction between photographic negatives and prints, but I can't really blame Ennis for not guessing what photography was going to turn into a couple of decades after his story.) I will say that John McCrea's art here is some of the best I've ever seen from him. I don't know what 2000 AD and Judge Dredd Megazine's page rates for painted color work were at this point, but they have to have been high enough to encourage artists to linger over their work: both magazines had some beautiful-looking stuff. Then we get the two short stories; maybe they were included for completeness's sake. They're both pretty insubstantial, if attractive-looking. 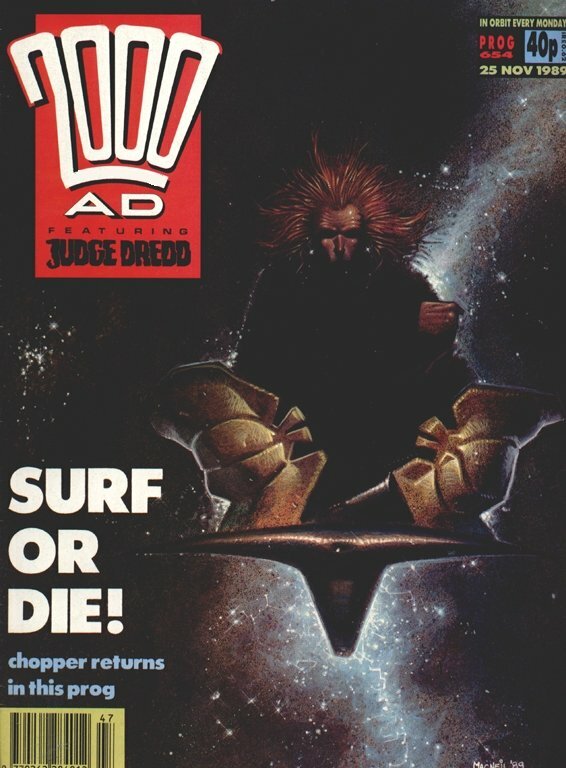 "Dead Man's Twist" is much more artist Martin Emond's show than Ennis's or even Chopper's (as you can see above, Emond is way on the far end of the kind of representational artwork that usually appears in Dredd and its spinoffs); "Funeral in Mega-City One," prepared for one of 2000 AD's "poster progs" (big poster on one side of a folded-over sheet, six-page story on the other), is a trifle of a thing--its text is under 300 words long, and it... certainly is a six-page piece with Chopper in it. 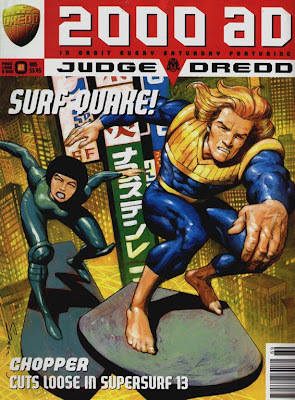 Alan McKenzie and John Higgins' "Supersurf 13" is another sequence that's much more notable for its artwork than its story. 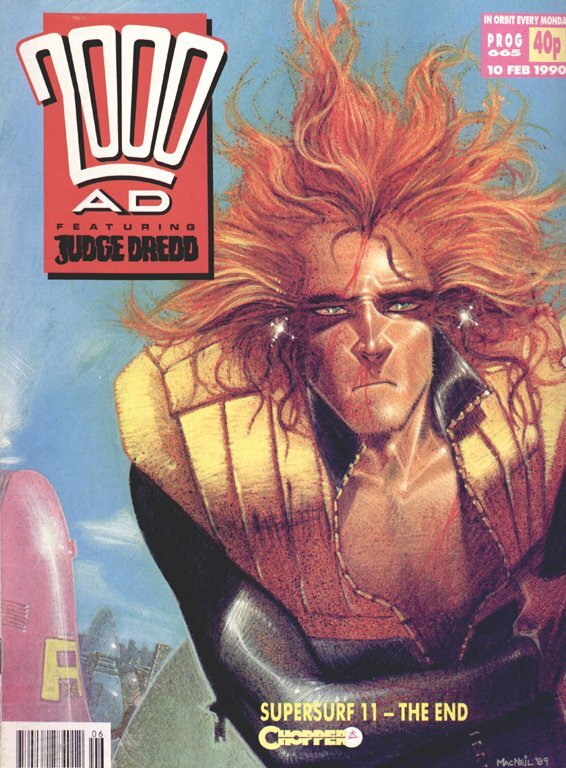 I can't tell how John Higgins achieved the sort of colored pencil/airbrush effect he uses here, but it lets him show off the high-contrast end of his uncanny color sense--the color reminds me a bit of his work on "Joe Dredd's Blues," although the actual drawing technique is drastically different. There are a few remarkable individual images, too, especially that half-abstract full-page shot of a ship landing in Mega-City Two. The story, though, falls almost totally flat: if "Soul On Fire" is the silhouette cast by "Oz," then "Supersurf 13" is the Silly Putty imprint of "Song of the Surfer," a smudged, muted recapitulation. I like the idea that Supersurf 13 is not just somewhat defanged but actually reality-show-level ridiculous, although the mortal-danger elements that remain undercut the suggestion that victory in this competition would be meaningless for entirely different reasons than in Chopper's earlier competitions. And if Smokie the Magical Aborigine in "Song of the Surfer" is a little iffy, the Japanese-people-are-so-weird! routines here are intensely wince-worthy ("your friend Chopper is in deep sushi"?!). Also, I suspect this may be one of the very few Judge Dredd-related stories that have appeared in 2000 AD but have subsequently been declared noncanonical. The unsustainable element in this one is the idea that Hondo-Cit is building new housing for its citizens on the post-"Judgement Day" site of Mega-City Two; give that half a moment's reflection and it makes no sense at all. Still, Wagner's always been good at the yes-and game of collaborative worldbuilding: "The Big Meg" acknowledges as much as possible of Alan McKenzie's story, especially the death of Jug's family, and quickly moves on. Calista's a by-the-numbers femme fatale, but it sort of makes sense that Chopper would fall for her--he's wily, but not especially bright. (His signature image is a smiley-face, after all.) It also makes sense in the context of the ways in which this is an old-fashioned noir crime story, with Venetian blinds and everything. (I suspect the title's a nod to "The Big Sleep.") The noir stuff might have been clearer with a more distinctive visual approach--Patrick Goddard and Dylan Teague's artwork looks much more like current American superhero comics than anything else in this volume, and while it gets the story and its set-pieces across, it doesn't have a lot of stylistic zing. But just look at what a jewel of concision "The Big Meg" is. In the first episode alone, we get massive amounts of worldbuilding, Chopper trying and failing to pass as his former rival, Justice Dept. knowing more than they're letting on, the relaxed-looking sequence about Jug's last ride that actually incorporates enormous amounts of exposition, Jug's death scene echoing the famous scene from "Oz" of Chopper in the storm (which itself echoed the end of "Midnight Surfer"), and finally a berserk action sequence. That all happens in six pages, constantly flipping back and forth between the main timeline of the story and flashbacks. Near the end of "The Big Meg", there's a page that incorporates two flashbacks that might just has easily have been presented in chronological order--but it works, because that's the mode of the story. I also love the fact that Chopper actually does look a decade and a half older than he did in "Oz." And the tag-line reproduced above, from #1388, is a joke so good I have to wonder if "The Big Meg" was written to give it an excuse to appear on a cover. 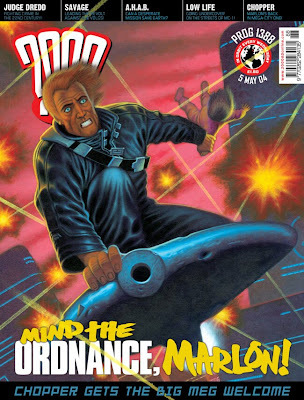 If you don't get what it's referring to, it's a callback to the single funniest line ever to appear in 2000 AD, from "D.R. and Quinch Go Hollywood"; go thou and get a copy of the D.R. and Quinch collection pronto. Close the curtains, Geoffrey, I'm amphibious. Next week: back to the Complete Case Files for volume 13, featuring "Young Giant," a whole lot of comedy-style one-offs, and a modicum of setup for "Necropolis." That Chopper story was the first place I ever saw Marty Edmond's art, and I still think it's some of his most gorgeous work. The comic world lost something extraordinary when he died. 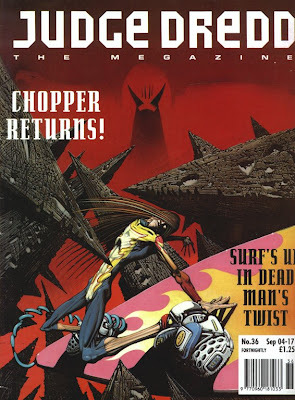 It might have been Wagner's idea to bring back Chopper with Ennis writing. He was basically a co-editor for much of the early Megazine stuff, and I'm fairly sure Ennis was handed the idea, rather than coming up with it himself. As Bob suggests, I suspect Wagner probably felt they needed Chopper for the Megazine.